Translations into English are available here and here. The first is closer to the original text, and attempts to remain poetic. The second translates not only the dialect, but also the expressions and metaphors. You can take your pick. When I was at Mike's house, the subject of Haggis came up somehow. I mentioned that I had eaten Haggis once, and that it wasn't really all that bad. It tastes like meatloaf with lots of oatmeal filler in it. As long as my eyes and mouth kept telling me that it was like meatloaf, I could eat it just fine. I just told the parts of my brain that were complaining that it was really made of the unmentionable leftover bits that it didn't matter -- meat is meat, and people have eaten those bits without any trouble for thousands of years. It really does make sense to grind them up into sausage or haggis or whatever since it's the sight and texture of them that are objectionable. 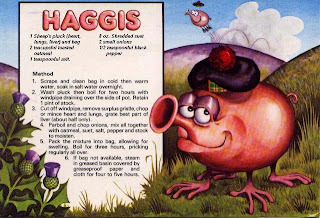 Anyway, back to my Haggis story. I went to a Scottish festival with my roommate Elizabeth. It was held on board the Queen Mary in Long Beach. We went to the booths of each of the clans and got them to stamp our "passports" with their crests. We watched the dancing competition and did some shopping. One of the highlights of the day was the sheepdog demonstration. Those dogs were SOOOO excited to get out there and chase those sheep. There was one dog in particular that couldn't stand to see the other less experienced dogs do it wrong, and she'd dash out and get the sheep back in line before her owner could call her back. The other highlight was when they had every pipe and drum corps in the west line up and play a few songs as they marched down the street. There were men in kilts and bagpipes as far as the eye could see. It was truly a thing of beauty. Towards the end of the day, there was the Haggis. Everybody gathered in a big hall, and a man went up on stage. He held his Haggis high, and lovingly recited this poem. Then he cut it up and everybody got a little slice. It was a fun day. As a funny final anecdote, when telling the story to Mike and Miriam, I couldn't remember who had written the poem. One of them suggested that it might have been Robert Burns, and the other said, something like, "Well, yeah. Of course. Who else could it be?" WHOA : real coincidence here: I spent the day doing ironing and knitting and moving stuff to the upstairs in prep for Mom and Dad to move in on Tuesday. So I was watching the 2nd year of ER in the background. In one episode, Dr Morgenstern (jewish father, scots mom) was carried into the ER in a kilt: he had somehow dropped a caber on his leg and broken it. He was despondent as it was HIS year to have the honor of cutting the haggis. He had memorized THIS POEM and recited portions of it (esp stanza 3 which is so appropriate for a surgeon). Then we heard bagpipes and all his nephews marched in with pipes and drum and they cut and served the haggis to everyone in the ER. Ooh, ooh, perhaps the ER episode was written by someone who attended the event on the Queen Mary. Ha.